Astronomers have discovered a massive ring system circling the exoplanet or brown dwarf dubbed J1407b. One scientist referred to it as a “super Saturn” due to its size. In fact, it may even be home to a moon the size of Earth. The discovery marks the first time a ring system has been seen existing outside of our solar system. New analysis shows there are over 30 rings in the system, each measuring tens of millions of kilometers in diameter. Scientists also discovered gaps in the rings, which indicate that satellites (exomoons) may have formed. “The star is much too far away to observe the rings directly, but we could make a detailed model based on the rapid brightness variations in the star light passing through the ring system. If we could replace Saturn’s rings with the rings around J1407b, they would be easily visible at night and be many times larger than the full moon,” Leident Observatory astronomer Matthew Kenworthy said in a news release. Astronomers analyzed their data from a survey designed to detect gas giants that move in front of their parent star. In 2012, astronomers from the University of Rochester reported the discovery of unusual eclipses occurring on the young star J1407 – the sun around which the Saturn-like J1407b revolves. The scientists proposed that the eclipses were caused by the huge Saturn-like rings of a new exoplanet or brown dwarf. 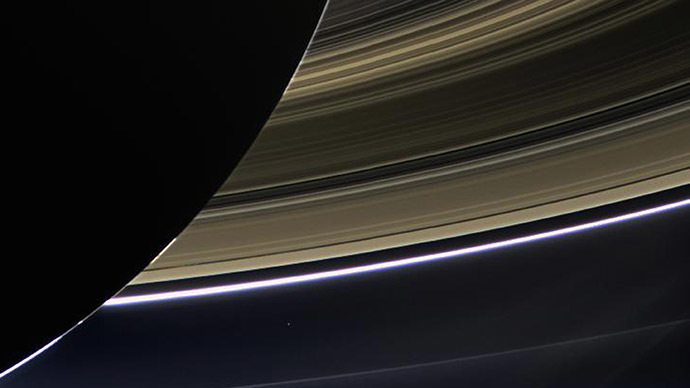 It is the light curve which tells astronomers that the ring system is bigger than the rings of Saturn, and they contain roughly an Earth’s worth of mass in light-obscuring dust particles. “If you were to grind up the four large Galilean moons of Jupiter into dust and ice and spread out the material over their orbits in a ring around Jupiter, the ring would be so opaque to light that a distant observer that saw the ring pass in front of the sun would see a very deep, multi-day eclipse,” Mamajek said. Mamek also suggested that there’s enough of this material to form exomoons. “In the case of J1407, we see the rings blocking as much as 95 percent of the light of this young Sun-like star for days, so there is a lot of material there that could then form satellites,”he said. Astronomers expect the rings to become thinner in the next several million years and eventually disappear as satellites form from the material in the disks.